John Cavazos Jr., an associate professor in the Department of Computer and Information Sciences and Department of Electrical and Computer Engineering at the University of Delaware, died on Nov. 3, 2018. He was 49. Dr. Cavazos was born in Harlingen, Texas, on July 3, 1969. He received a doctoral degree in computer science from the University of Massachusetts and joined UD in 2007. During his time at UD, he was a JPMorgan Chase Faculty Fellow in the Institute for Financial Services Analytics. He was also founder and CEO of AI Cyber Security start-up Cyber 20/20 Inc.
As a researcher, Dr. Cavazos published extensively in the areas of cybersecurity, machine learning, high performance computing and compilers. 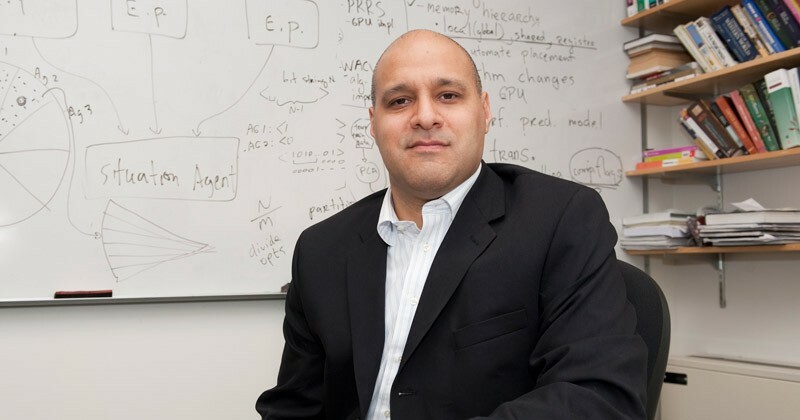 He was one of the first researchers to work on applying machine learning to improve compilers, a field of research that has since grown and flourished. In 2010, he received the prestigious NSF Career award for his research on applying machine learning to compiler optimizations. Later, he focused on large-scale static and dynamic analysis of malicious applications. Dr. Cavazos is survived by his wife, Victoria Stephanie Emma Kumaran of London, UK; two sons: John Matthew Cavazos of New Castle, Delaware, and Louis John Cavazos of Germany; daughter, Emma Luisa Cavazos of Germany; father, Juan W. Cavazos of Brownsville, Texas; mother, Maria Reyna Cavazos of Trenton, Illinois; and three sisters: Patricia Cavazos-Rehg (Mike) of Trenton, Illinois, Jessica Cavazos-Rochat (Ross) of Chesterfield, Missouri, and Roxanne Vara (Robert) of Kingwood, Texas. A visitation and graveside service were held on Thursday, Nov. 8.